The AudioBox 44VSL is the second model in a new generation of PreSonus USB 2.0 audio/MIDI interfaces that take hardware/software integration to the logical next step. Using your computer CPU and PreSonus Virtual StudioLive (VSL) software, AudioBox VSL-series interfaces provide reverb and and delay effects and the same Fat Channel compression, limiting, semi-parametric EQ, and high-pass filter, as the PreSonus StudioLive 16.0.2 digital mixer- all with inaudible latency. Furthermore, thanks to the power of VSL, the AudioBox 44VSL includes an 8x4 software mixer. As a result, with just an AudioBox 44VSL and your laptop or other computer running VSL, you can mix a studio session or a live show featuring, say, a guitar duo with vocals, a small band, a DJ rig with mixer and stereo synthesizer, or a panel discussion-all while monitoring and recording with or without real-time processing! And you can do it simply and easily, with no hardware mixer, no outboard effects rack, and minimal wiring, thanks to the tight integration between PreSonus hardware and software. 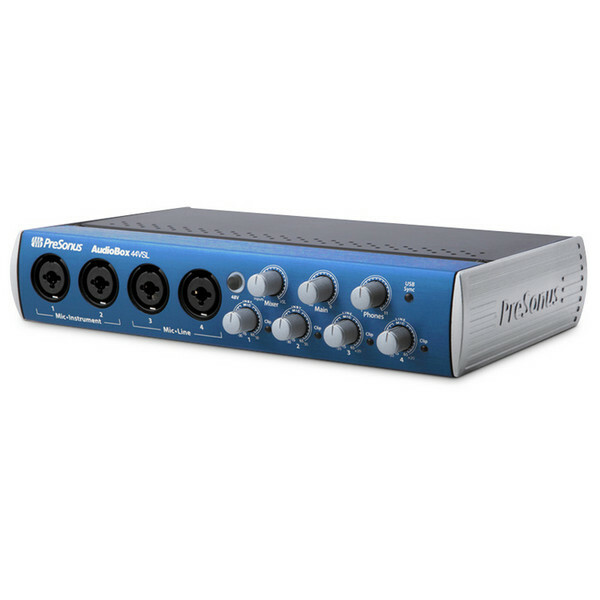 To top it off, while the classic PreSonus AudioBox USB is a fine-sounding unit, the new AudioBox VSL series sounds even better, with 24-bit, 96 kHz recording and top-of-the-line PreSonus XMAX preamps. 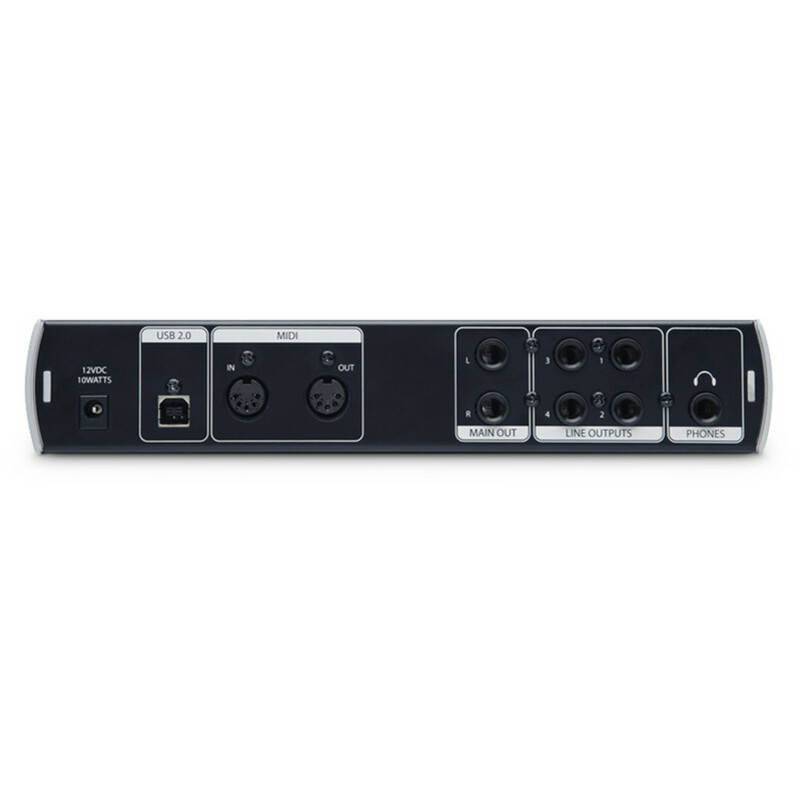 Click on the link below to download detailed specs on the Presonus AudioBox 44VSL USB Audio Interface. Fortunately, the Presonus engineering wizards have dramatically reduced processing delay in the AudioBox VSL series. The result: dynamics processing, EQ, reverb, and effects that feel real, with no audible delay. Presonus didn't invent the first audio interface with effects. They simply did it better and for less money. Sure, some interface manufacturers that don't normally make signal processors have added a compressor, EQ and a few effects to their interfaces. But the AudioBox VSL series provides all that, plus a separate limiter, expander, and high-pass filter-and Presonus have been making high-quality signal processors since 1995. The AudioBox VSL-series' Virtual StudioLive (VSL)-based effects and Fat Channel processing have been extensively field-tested and proven popular by tens of thousands of StudioLive-series mixer users, including many top professionals. Discrete components - not op-amps. Presonus only use genuine transistors, resistors, and capacitors for ultra-low noise and transparency. Op-amps add noise, coloration, and harshness to a signal. Class A circuitry. Class A circuits have no crossover distortion and deliver purer, clearer, and more musical results than the Class AB designs that are found in many preamps. The net result of the XMAX preamp design is high headroom, low noise, wide dynamic range, extended frequency response, and-most important-musicality and transparency, with smooth highs; solid, deep lows; and everything in between. PreSonus gear has a well-earned reputation for extreme roadworthiness, and the AudioBox 44VSL is no exception. It employs a heavy-duty steel case that is every bit as rugged as that of the smaller AudioBox 22VSL and original AudioBox USB-the unit Presonus famously stomped, kicked, and drove over with a full-size truck before using it to make a very nice recording. It also fits in a half-rackspace and can be screw-mounted to a standard rack tray (not included). VSL enables you to easily manage the processing and mixing from your Mac® or Windows® PC and provides editor/librarian functions, making it simple to create and use a library of presets. To get you started, Presonus have included the same library of more than 50 Fat Channel presets that comes with StudioLive mixers. These presets were created by professional musicians and engineers and let you instantly set up dynamics processing and EQ for vocals, guitar, and much more. Seamlessly integrated with the included Studio One Artist DAW and VSL, the AudioBox 44VSL interface works with virtually all Mac and Windows audio-recording software. And unlike most things nowadays, it's very easy on your budget. So get the next-generation USB 2.0 interface that gives you real-time, low-latency effects; rock-solid construction; software mixing; and high-end audio for low-end prices: AudioBox 44VSL! PreSonus' revolutionary digital audio workstation, with unlimited track count and 4+ GB of 3rd-party resources.